Professor David Dorondo in class. An important new equestrian study has been launched by Professor David Dorondo at Western Carolina University. 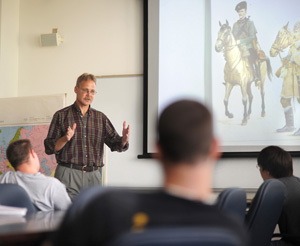 Entitled The Horse in European History, the lecture series presents a balanced view of how the horse affected history. Two titles in the Long Riders' Guild's Equestrian Wisdom and History series have been chosen to be texts for this ground-breaking class. Guild founder CuChullaine O'Reilly talks to Professor Dorondo about his course. What event, book or insight served as your personal inspiration for teaching this class? My inspiration derives from my own interest in horses and my research in German military history. As my writing progressed, I came to appreciate the vast consequence of the horse in European history, an importance which we largely forgot in the mad technological rush of twentieth-century Western society. Why did you feel that this class "The Horse in European History," needed to be taught? Had the topic been ignored by other academics? Because of what one might call "civilizational forgetfulness" the students in my class hadn't a clue about horses, much less the sort of impact they had in European history. I don't say this as criticism, merely point out how much we have lost from our collective historical consciousness. As a horseman yourself, do you feel that equestrian history is often misinterpreted by pedestrians who lack first-hand equine experience? Absolutely. I don't subscribe to the view that historians have to practice what they write about in order to understand it, but it helps! In my estimation, horses must be experienced by those who would try to write about them. European equestrian art, as practiced by the Spanish Riding School, has been portrayed as being of military use. But how do those movements compare to the horsemanship practiced by Central Asian mounted warriors? What I find most striking in comparing that art to the horsemanship of the steppe is the relative artificiality of the former. Steppe horsemanship almost always functioned more efficiently from the point of view of the symbiosis between horse and rider. One unique aspect of your class is that you have used books written by Littauer and Jankovich, two equestrian academic masters from Russia and Eastern Europe. Doesn't your class, and these two books, demonstrate that the western needs to look further afield for other sources of equestrian wisdom? Yes! The opening up of Central Asia to Western horsemen/scholars since the collapse of the Soviet Union could provide a potential gold mine of collective equestrian wisdom. In terms of overall historical importance to the development of the human race, who do you believe had a greater impact on history, Pluvinel or Genghis Khan? Genghis Khan, unquestionably. There is no doubt but that he is what German historians used to call a "world historical figure."